Alaa Eddin Janid grew up in Aleppo, Syria. Over the course of his young life, Alaa journeyed from the world of privilege, to witnessing and experiencing the persecution, oppression and brutality of the Assad regime. As an activist Alaa joined forces with other young people in Aleppo to fight for democracy and human rights, but due to the increasing dangers in the country, Alaa was ultimately forced to leave Syria and become one of millions of people who fled their homes to seek refuge in other countries. His harrowing journeys took him through Turkey and through Europe until he finally gained refugee status in the Netherlands. During his travels, Alaa continued to help others in any way he could. 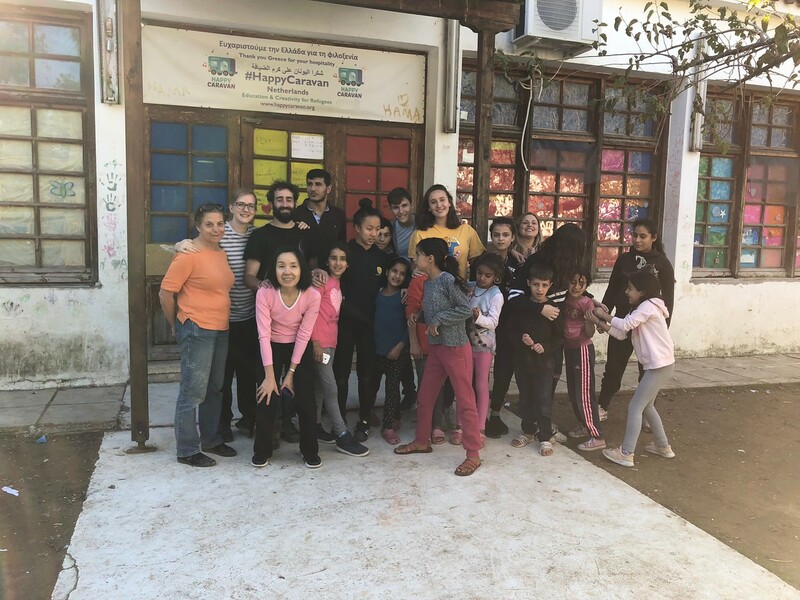 Ultimately Alaa channelled his compassion and activism and founded a school for refugees children, Happy Caravan, located in the Thermopylae Refugee Camp in Lamia, Greece. To prepare those affected by war or natural disaster for a better future through the means of Education and Creativity. the International School of Prague decided to partner and work closely with Alaa and Happy Caravan. In line with ISP’s strategy, to “create change that is bigger than we are,” the school aims to provide not only financial and material support, but to be an integral part of the Happy Caravan educational program, sharing our expertise through our teachers and students in support of the the children from Thermopylae Refugee Camp in Lamia, Greece. 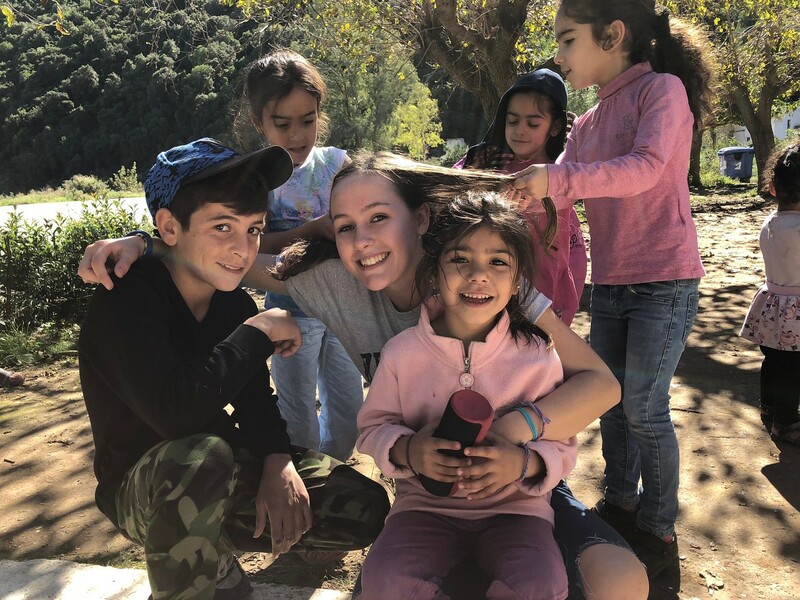 After an initial visit by ISP teachers and extensive planning, this past October, four ISP Upper School students, Alana, Lili, Vivi and Oliver, joined with a group of ISP teachers to spend a week at Happy Caravan, teaching, playing and caring for refugee children of all ages. Upon their return from Happy Caravan, the students created a short video about their inspirational visit. Recently, Alaa returned to ISP to participate in the ISP Refugee Awareness Week, speaking with students, teachers and parents about Happy Caravan. 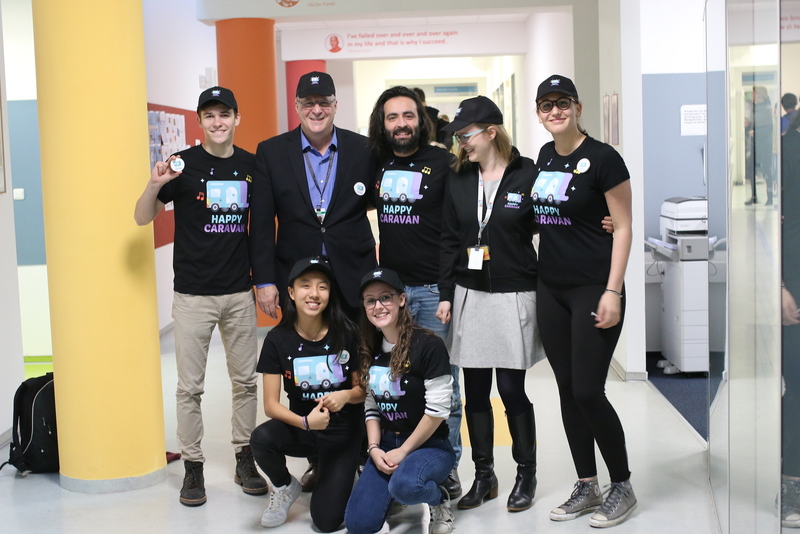 During his visit, I had the opportunity to interview Alaa, Nina Horkova, (ISP teacher and Happy Caravan Education Manager) and three of the four students who went to Happy Caravan in October, Alana, Lili and Vivi. Below are excerpted highlights from this inspiring and frank conversation. Alaa, what was your personal journey? I was born in Aleppo the oldest city in the world. I was in a bubble, I didn’t know about the other situation in Syria. My father was rich. I grew up going to school and working in my father’s polyester factory in Aleppo. When coming into contact with people who worked the land in difficult circumstances, I realized I was lucky and it wasn’t the normal life. Over time, I started to see the reality of this life. I began to realize that when I helped someone, it wasn’t only because of helping him, but because I also enjoy. I would lie if I told you that I am doing this for humanity. I do believe in that, but I enjoy! In 2011 all those things start [in Syria], there was the revolution. You start having all those amazing conversations with people, speaking about revolution and freedom, about democracy, about respect and human rights. Oh wow, wow, wow, it was amazing. We read books about that and passed it on to other friends, under the table because it was dangerous. And then we started making demonstrations in the streets with our friends. We could only demonstrate for 5 minutes at a time and then run away because it was dangerous. We made graffiti in the night all over. We bought 100 rabbits and draped them in the tri-color flag of the revolution. We took the rabbits in the car at night and let them out and they ran everywhere. The two they caught we don’t know until now what happened to them. We hope they are NOT alive…, that would be so much better for them. Wait, you hope they are alive? No, I hope they are dead. Why? Because I know what happens. For example one of my best friends, she is now in England. They had her for 3 months. Her family had so much money and they got her out. In just 3 months she came pregnant, her teeth destroyed and so many other things inside. So you’re saying that the torture is worse than death. Yes, for example Nasser was tortured with a plastic cable tie which was slowly tightened around his neck so he died slowly. And they just put him near our school. Near our school so if you tried to go over to help him, there was a sniper who would shoot you. It was such a hard and crazy situation and each day was the last day. After that I left to the other side of Aleppo and I worked with a refugee service. And then came Al Qaeda and ISIS. So it was time to get out of Syria. It was so hard to get out, because if people knew that Alaa was trying to get out, I would be killed. The smuggler warned us about the sniper as we tried to cross to Turkey. And the Turkish sniper was so good, you could hear the bullets so near you as we ran from point to point. After a short period in Turkey, like if I go to buy a shawarma, I see people from ISIS going to buy Shawarma. I realize they can enter here and have a normal life and go fight? It was for them kind of a vacation war. So I decided to go with a smuggler by boat to Greece. After many more difficult times I made my way to Paris. I took a taxi and the driver asked me to where and I said to the Eiffel Tower. It was the only place I knew about in Paris. I went to a cafe and started to drink a lot of vodka and then started to cry. The garçon came and asked if I could pay. I said I could pay, but was just sad. I was sitting there with WIFI and thinking there was chemical attack back there and here was the Eiffel Tower. So much stress, so much stress. Finally Alaa made it to Amsterdam where he, now with no money, presented himself to the authorities. After many difficult experiences in many refugee camps, Alaa was finally granted asylum as a refugee in the Netherlands. His quest to help other refugees took him back to Greece where he eventually started a school for refugee children, Happy Caravan. Alaa: It began with my blanket, my TV, my tent and a projector. I offered lessons and children came. After one month the camp administration allowed me to join them. I realised that in order to start a school for refugee children I needed to learn about how to start such an organisation, which I did through YouTube. How to write project proposal, how to write cash flow. I got the papers I needed to start Happy Caravan and started the school. Through social media I spread the word and ultimately, Nina, an ISP teacher and the ISP Happy Caravan Coordinator travelled to the camp and began to get involved with helping Happy Caravan with curriculum and education. Now we rent a house, four rooms and a car. And now we have seven people from seven different countries working together with Happy Caravan. ISP students, Alana, Lily, Viviana speak about this transformative experience and what they learned from it. What motivated you all to go to Happy Caravan? Alana: My mom, when she came back from the trip. I’ve never seen that sort of happiness from a person. She was showing me all these pictures from all these children with big smiles on their faces. I saw how much it had impacted her. Personally, I absolutely adore being with children. It’s probably my favorite thing to do. I was very excited about it, but I’ve never really done such a huge service trip like this before. Lily: I went to a service trip to Malawi this summer to build a school. I saw so much poverty but really ended up there symbolically because we didn’t have the building skills. It made me realise that you could end up causing damage if your role isn’t clear. 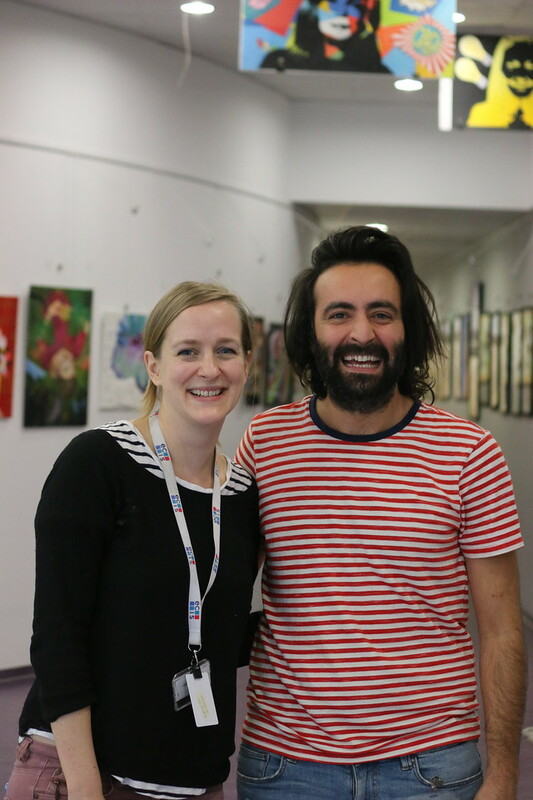 When Alaa came to ISP, Ms. Horakova brought up this idea and he’s such an authentic person, and I realized that we could use our skills to help and teach kids. We are really using our authentic skills to bring something good to the world. Vivi: I used to live in India before Prague. There we did lots of community service support, but in Prague the opportunities weren’t there in the same way. Like Lily I went to the Dominican Republic to teach kids, but everything was organized by the organization, but we didn’t have much of the role to organize. When Happy Caravan came along I was drawn to the idea that I could have a direct role in planning and working with the children. I want to be a teacher when I grow up especially with kids with special needs or in areas that need a lot of help. So it’s the perfect experience and opportunity to help the kids out. It’s interesting that all three of you and Alaa describe the happiness you feel when you are helping other people. You say you feel selfish, but I don’t see this as selfish. It’s something that’s important that you have chosen to do. So what was the experience at Happy Caravan like? Vivi: It was really hard but it was really good. It’s hard to talk about it. We were helping out but we were also dealing with the feelings of guilt. Why did we get to go to ISP and live this kind of life? Why didn’t they? And so that was tough. There’s no reason for the difference. Alana: I always thought they’d be different, traumatized kids. But they’re completely normal kids. They all have fun, they all laugh, they all scream, they all misbehave, they do all these things just like any other normal child. The only really big difference compared to other kids is that they can sometimes be really grateful. But even so they’re exactly like any other normal kid I’ve ever met. How did you know they were grateful? Alana: For example when we’d give out small pieces of fruit, they would all be so excited. This small piece of fruit would be everything to them. Whereas kids here would say, no I want a doughnut. What changed me was to realize how normal and similar to every other child they are. How happy they can be with a little bit of attention. Lily: When we were busy with the kids, trying to teach them things. you’re really in the zone and don’t think about what was happening. I stood back and throughout the day I found myself tearing up because the difference between us, it’s not as people, but the opportunities given to us. No one deserves being in a life like this. When they were in Syria and there was no war they were just like us and now they come to Europe and they’re seen as people who need help or people who are secondary citizens or people who can’t help our society function. Thank you for your willingness to talk about it. It’s very powerful and inspiring. I’m really proud of all of you. You started something that resonates with a lot of people. You spent a week with these kids. Do you feel like you had a positive impact? Vivi: I think it’s easy to not think about things like that, get caught up with your daily routine and everything you do in your life. When you do service work but don’t actually go to the place in need and have a one hour lunch meeting… but when you go and you talk to these kids and you see them and are with them it’s a lot harder to come back and forget about it, and have it be a one off thing you do for service hours. 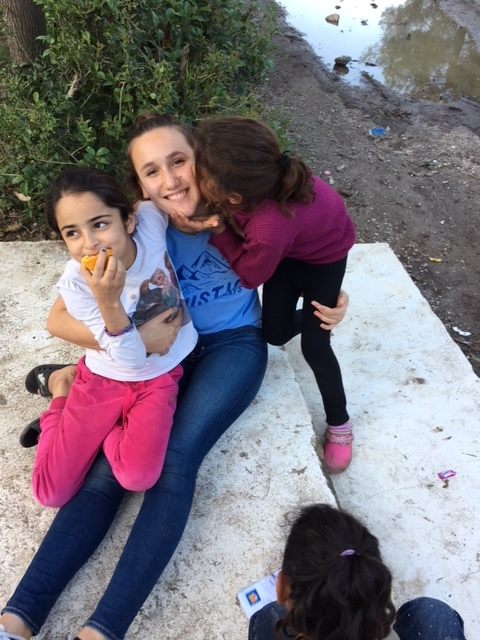 Alana: Even though we were helping out a small selection of all the refugees I used to think, like when I heard about Jordan Hatar helping one family. I used to think that’s kind of useless. Why would you put all of your efforts just to help one family out of all the millions of people who need help? But once you get to meet these kids they’re not just numbers any more. They’re people, there’s so much that you don’t know about them. Once you meet them they’re people you’ll never forget. They’re people that change you. All the little girls and little boys, it’s just they’re not numbers. That made a really big difference in my mind and I hope I can share this with many more people. So even if it’s a small change that we’re making… like one of the girls really wanted one of the toys to take home. I really wanted her to take it home because it’s was huge to her. Small differences like that really do mean a lot. Even if it’s just one person you’re helping, it’s still a person. Everyone deserves the opportunity, they’re not just numbers, they’re real people just like us. Lily: When you’re there you think, it’s only a week. How much of an impact are you going to make? When we’re there we know a whole community is behind us and a whole community is supporting us towards this cause. [ISP] moms would bake bread and bring it to us. There was a dad who gave us a jar of candy and pushed it into our hands and said “give it to the kids.” Happy Caravan being there is one thing that makes their stay better and stay bearable. A lot of the kids told me that Happy Caravan makes them happy and that it’s the only thing that makes them happy here. Alaa: I was in your school [ISP] six months ago, and I remember the reaction of the kids of many different ages when I was speaking with them. Let’s say they were interested and were listening. Now after six months and you students went there, and after this video you made about your trip, in each part of the school it was like a nirvana. Even young students were asking “do you accept small kids?” I really believe that you are ambassadors for this idea. That’s true not a compliment. 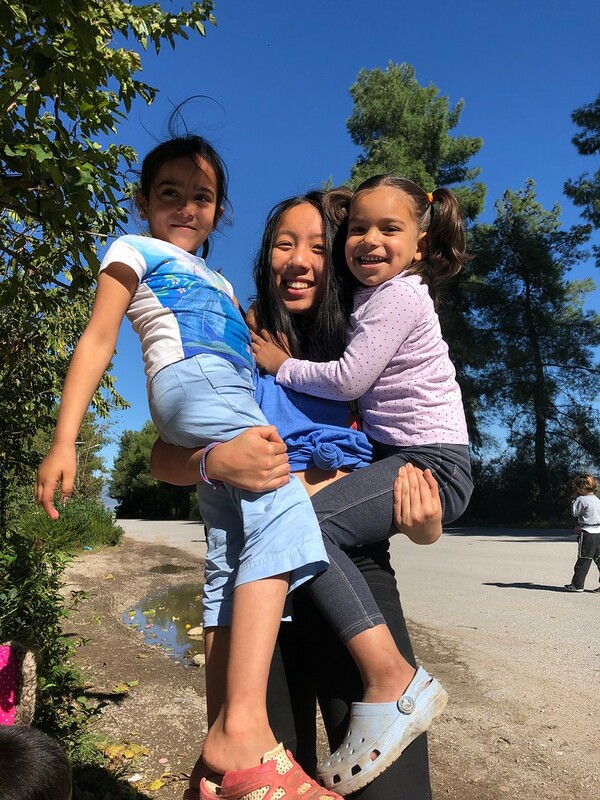 Nina: As the for the Happy Caravan kids, ever since I started there, some of the kids are still there, seeing how much the kids are improving because of the school, it’s amazing. And so, at the conclusion of the interview, I felt inspired and in awe of these caring young people. Their time with the children of Happy Caravan was truly transformative for them. There wish is to not only return soon but to spread the word about what they have learned through helping others. Previous post Happy Caravan and ISP: Creating change that’s bigger than we are!